10.25.13 | Oh Look! It's A Blog! Finally posting the final portion of my current home set up! This is pretty much part 3 since I broke it down into sections. You can see the yard part –here– and the exterior –here– but today I am covering all the interior things. A lot of the stuff shown is available at current events going on including The Garden, FaMESHed, Acid Lily and Horrorfest… ( so many events!). The heads and plushies as well as the table are all available at Horrorfest. Since I showed my little table I figured I would show the rest of the interior of my home. It features the new set from Kuro and the fireplace from MudHoney both available at The Garden, and also the Ashdon furniture set from Trompe Loeil. (which I have blogged previously but continue to use in all my houses because I love it and it is texture change so it is super easy to match anything). → Trick or Treat Sign: Second Spaces – (Elle Kirshner) – trick or treat? *includes all the decor and Fall sign. → Board with Papers: Nordari – (Jordan Giant) – Pinbee. – music. 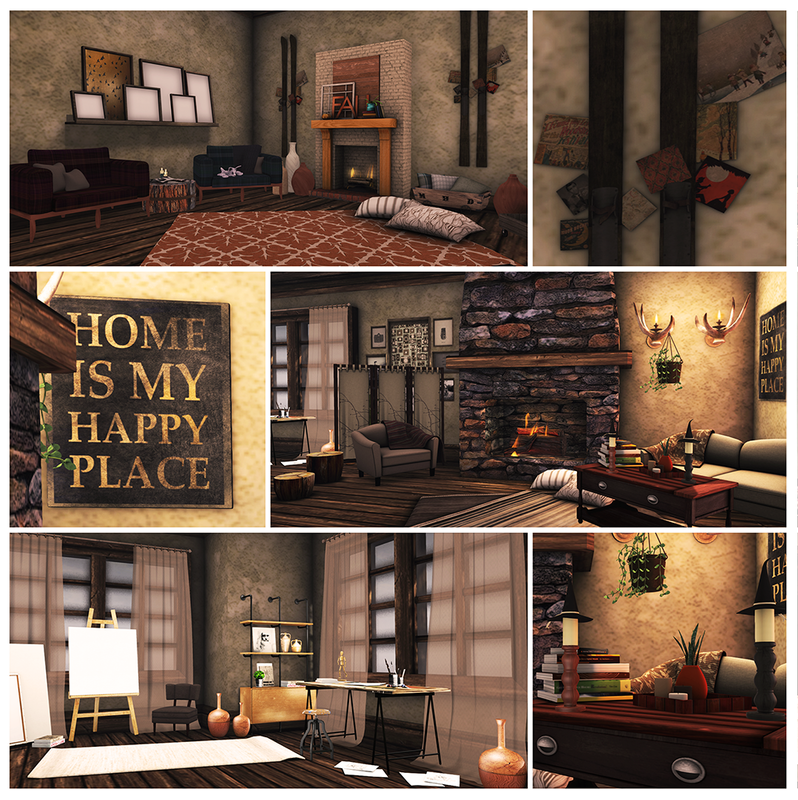 This entry was posted in iheartslFeed, Uncategorized and tagged :FANATIK:, A&A, Acid Lily Gallery, Adore & Abhor, Adorn.Mint, Apple Fall, ARIA, Balaclava, BAZAR, Bedroom, blog, Cheeky Pea, Collabor88, Collage, Culprit, Decor, Decoration, Encore, fameshed, Floorplan, Furniture, Half-Deer, HalfDeer, Home, Horrorfest, Ionic, Kuro, Lark, LISP, Living Room, Mesh, MishMish, mudhoney, Nordari, Second Life, Second Spaces, Silent Sparrow, The Chapter Four, The Garden, The Liaison Collaborative, The Liasion Collaborative, Toronto, Trompe Loeil, Vespertine, what next, YAS, Yay and Stuff, Z, Zigana. Bookmark the permalink.